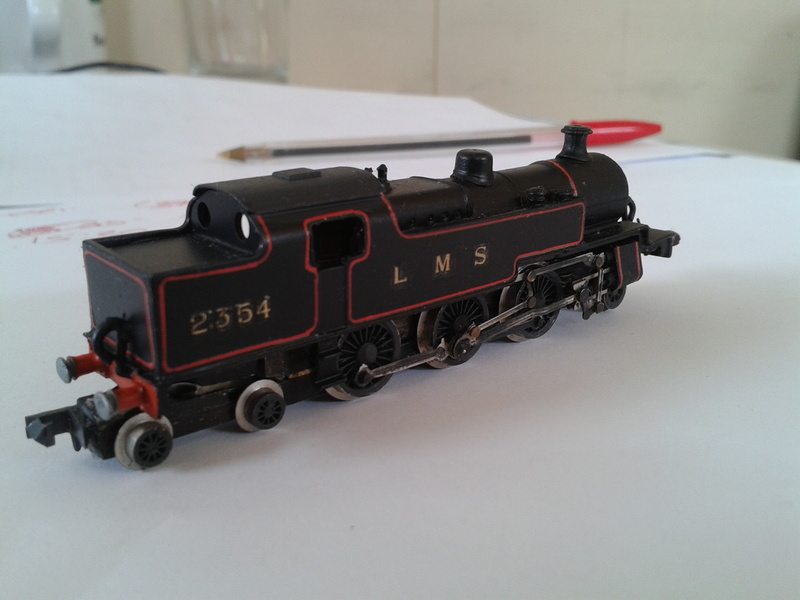 I always think that a locomotive that was lined in reality should be lined in model form. Personally, I think that you've done a lovely job with that and it would be a shame to hide it again under a layer or two of muck! 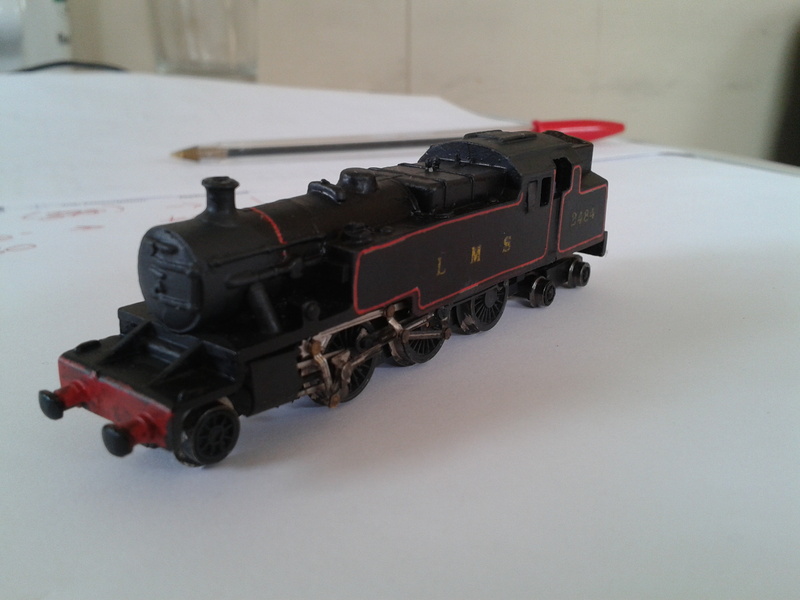 However, if you're determined to look for ways to tone it down a little then may I suggest you mix a little black (the same shade you originally painted the body with) with some varnish and lightly go over the lining. Not something I've tried myself yet but is recommended and demonstrated by Ian Rathbone (a highly skilled professional model painter) in his painting and lining book (which has become my bible in all things to do with paint!). Looking forward to seeing the other side lined up! Well I think I am going a little goggle eyed and mad, I have finally applied the lining to both sides of the Fowler 4P and Stannier 4P. I have taken some photo's but I don't think I will post them, the close up can be really cruel and it has highlighted a few areas that need a little attention. While I'm waiting for the lining to dry, I will have plenty of time to decide if I want to re-do the lining. From a distance it does not look too bad so maybe I will just apply a coat of varnish to tie everything in, before maybe some weathering is applied. Result nicely weathered fingers.........pictures may follow. 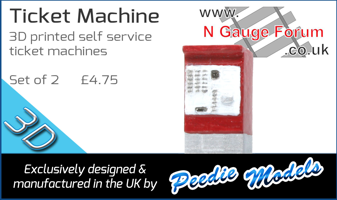 Anyway to stop being shouted at again by the nameless one, ATSO I thought I better get another update on here sorted. Now a couple of weeks ago while exhibiting at York the organisers had put the layout next to the N Gauge Society stand. 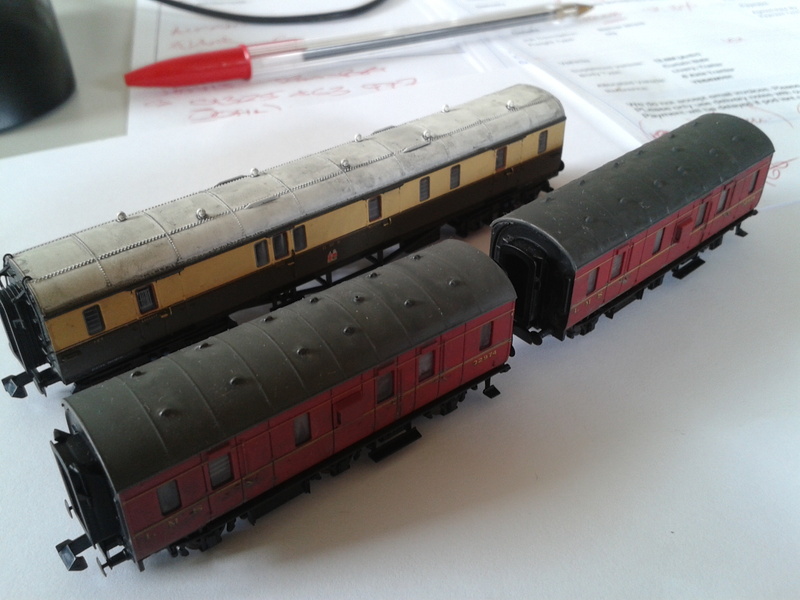 What could possibly go wrong....by the end of the weekend I had added this little lot to the rolling stock collection. 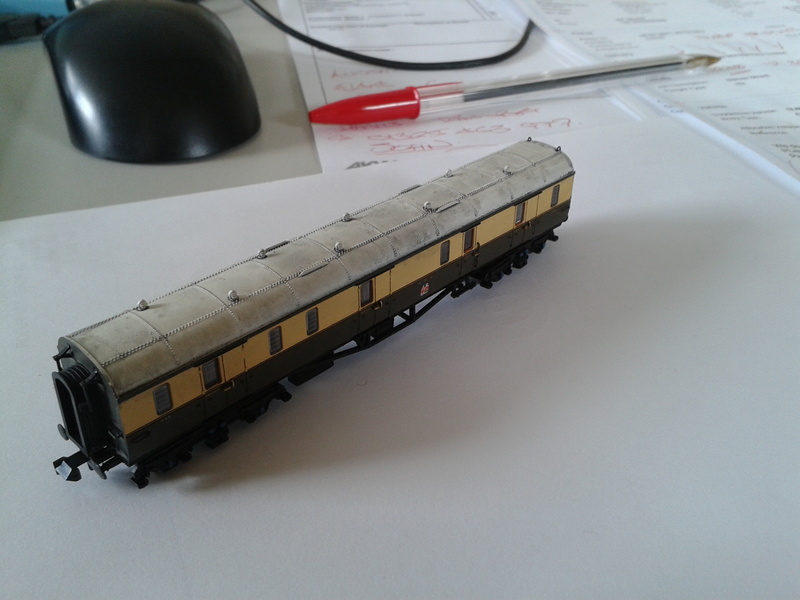 The problem is they all looked to clean trundling around on the layout in various trains, so they were quickly added to the weathering list, the only problem was getting the time to work on them. So when I had a couple of hours free on Monday evening I got weathering tools of destruction out and got down and dirty. At the exhibition, I was admonished by a chap for having too much weathered stock on the layout, he then told me in all seriousness that real trains were not like it as that was why the manufacturers sold stock pristine. Anyway based on this, even though I'm obviously wrong, I like my stock to be weathered and with my modelling it literally covers a multitude of sins. With the Collett Brake, the roof was just too bright, so I thought I would tone it down a little and try to represent a vehicle not long out of the shops but earning its money, so uniquely for me to be subtle. The only thing left to do on this is a little dirt to the solebars and the corridor connectors and I think it will pass, as a working brake? 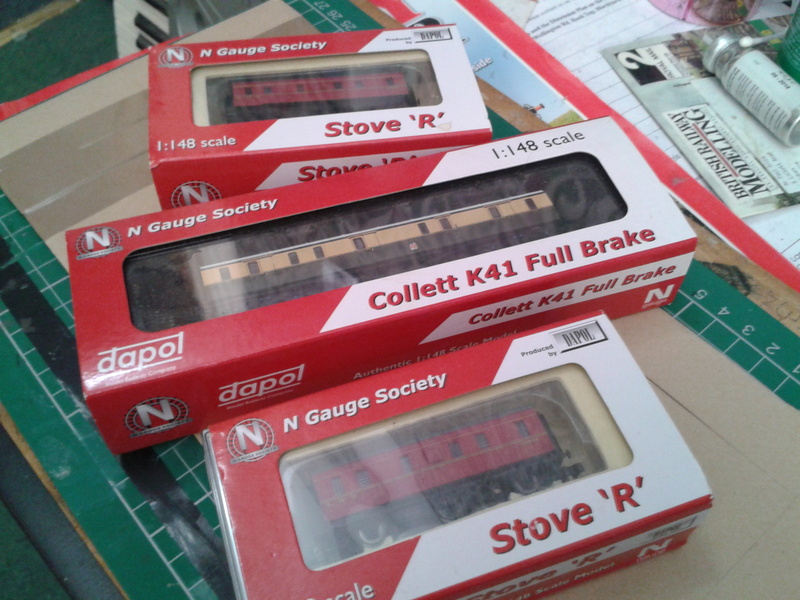 Now Stove R's, every prototype pictures of these I have show them in a bit of a terrible state, so I could have really gone to town on them. However I thought I would give the subtle approach a bit more practice, but I had to get away from them looking clean. I like working on roofs, I don't mean slating and tiling, I mean on the roofs of stock. I think seeing as most of us view our trains from above you have to do something to add so uniqueness to things. 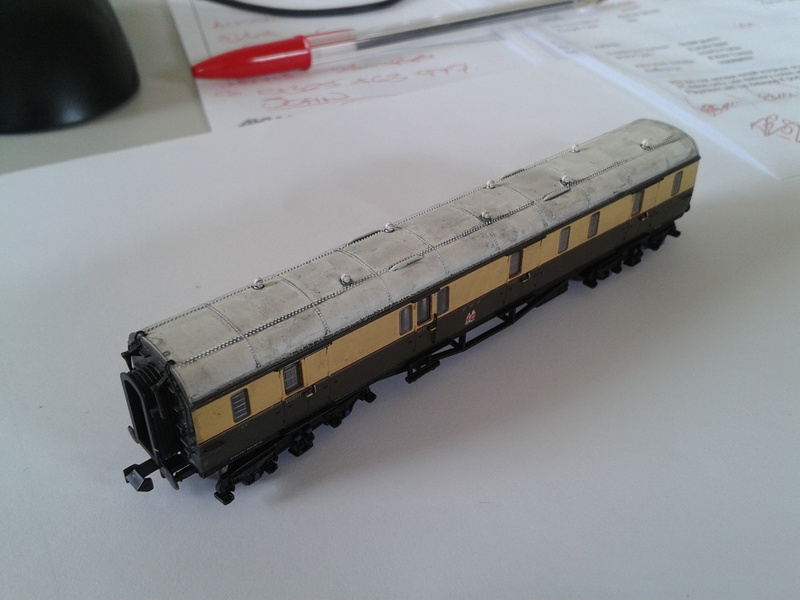 Again like the Collett I need to add a bit of road dirt to the under frames and ends and they should be okay for addition to passenger/parcel trains, I think I need a couple more (lets hope the N Gauge society is at the Wigan show). So there you are all 3 almost finished and ready to be released into revenue earning stock, and to the chap who shouted at me at the York show, ARE YOU RELATED TO ATSO? HA time to inflict another posting on poor unsuspecting victims, and this one actually involves locomotives. 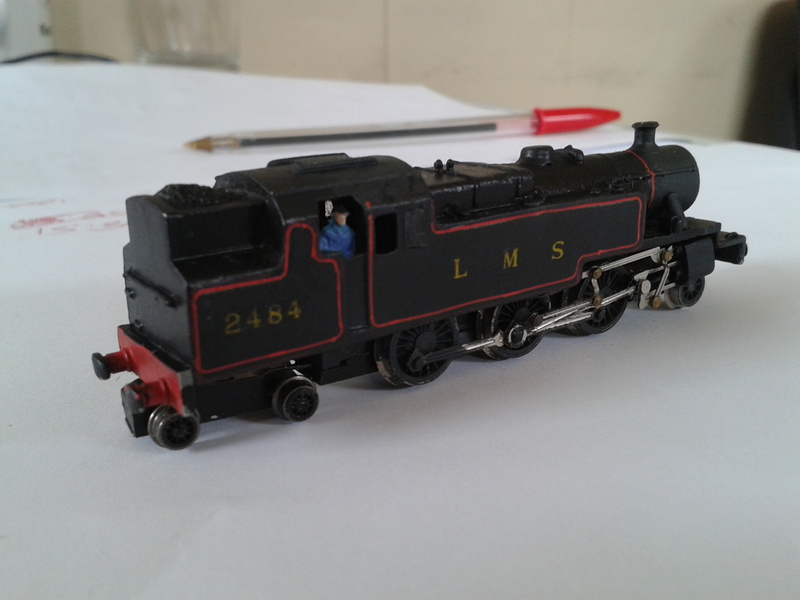 If you were strong enough or foolish enough to read one of my previous blogs, you would know I was working on a Fowler and Stanier 2-6-4Ts. Maybe working on is the wrong term so to go along with my big ham fists we will say butchery, it seems more apt. 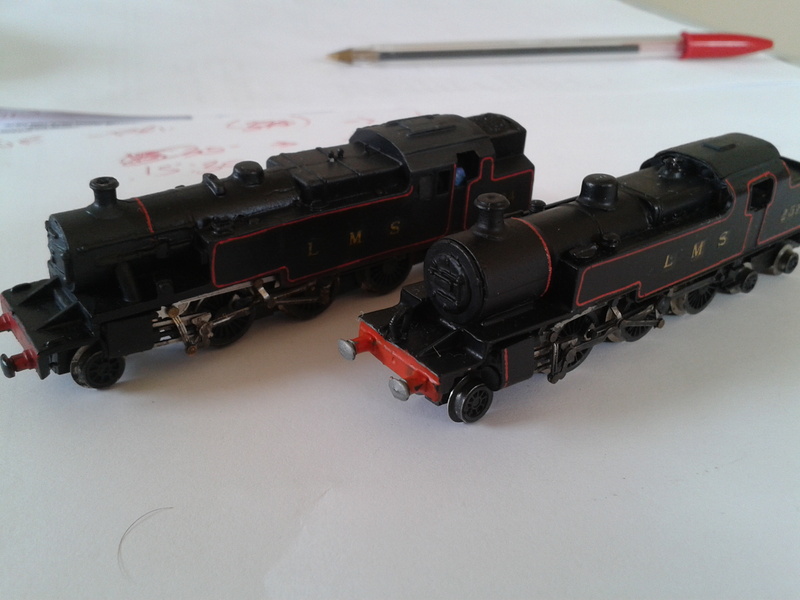 The camera shows things in a close up cruel light and it certainly has with my locomotives. Every shake of my hand and my much to be improved brushwork seems to be clearly evident, still I have applied a coat of satin varnish to both of them to seal the lining a bit and key it all in. 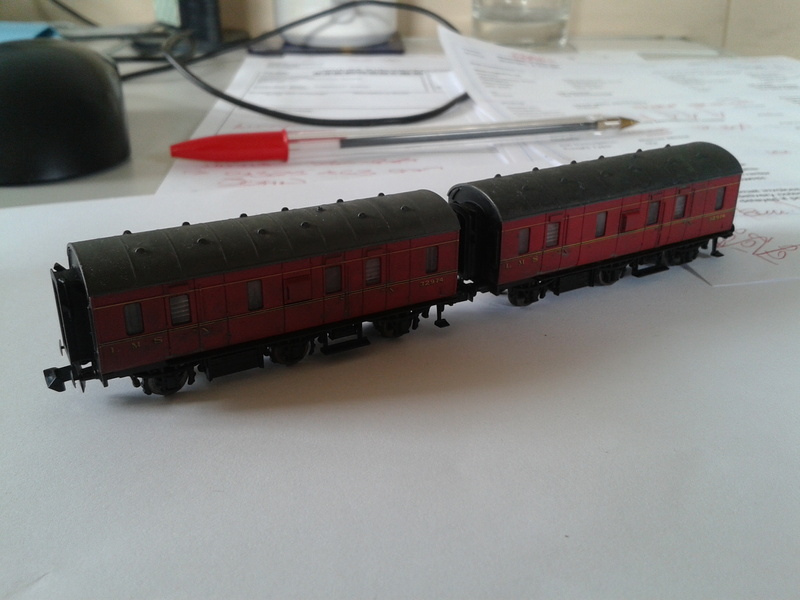 I have a couple of areas to finish, I cant believe I missed a band of the cylinder, and I really must sort that trailing bogie out. I DID NOT SHOUT AT YOU!!!!!!!!!!!!!!!!!!!! Anyway, I'm reminded about a conversation I had with a dear friend about Paul Price last night. Then again, that might not have happened... I might not actually know Captain Kirk... in fact it might have been in a movie... and not involved me... and might not have been referring to Paul Price! I hate to think what all the normal people think of these exchanges across our threads. I'm also worried that should we meet, and I truly hope that one day we do, it will not prove fortunate to the rest of the human race! Well not a lot of progress has been made on the various projects over the last few days, though a little time was spent last night on the chassis for the Black 5 hybrids. The good news is these chassis that were in the original "cant be bothered/scrap box" have actually turned into quite smart running chassis. This should not be much of a surprise, but they are even better than some of the more modern chassis in the fleet. Don't start about Margaret Rutherford again! Good to hear that progress is still being made. I have to say that I think that with the ever increasing desire to add finesse and detail, there is a tendency to over complicate the mechanical side of things. There is something to be say about the KISS principle that older chassis seem to follow. The only thing I have against the Poole Farish chassis is the equal spacing of the drivers on all the 0-6-0s' so many white metal kits were made to fit the chassis but most looked awfully wrong, the worst to my mind was the BHE King Arthur on a black 5 chassis, not only was the driver spacing way out, but also the diameter, they looked slightly better on a Duchess chassis with larger wheels; I ended up using a Peco Jubilee chassis with a UM tender drive with an extra pair of wheels. 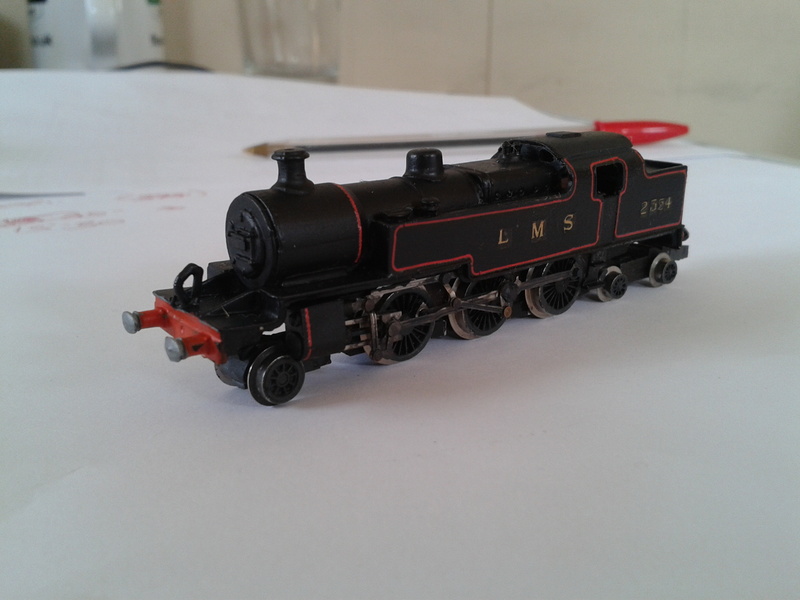 Well I ordered some bits from NBrass today when then arrive I should make a little more progress on the locomotives today.